We don’t know if any of you noticed that, but in the summary of 3×09 there were scenes they didn’t show in 3×08. The first footage was just a different shot (slightly different angle) and the second scene was not included in the actual episode, but we got this scene instead. We were just thinking about how great Liz is in the scenes when Anna is seriously annoyed by what the other people in the room are saying and (see the first cap here) you can tell how much Anna is furious inside, but she doesn’t say a single thing till she actually speaks for saying the most badass thing ever. She did that more than once in the show. Love it! Why the only person on the ship that notices that Melba is obviously Not Okay is our friend Rev. Anna? Because Rev. Anna is there to represent what is good and right about Earthers. She floats above the manipulations and self-congratulations of the scientists and religious figures around her, genuinely trying to care about people and solve problems. It’s a good thing too, because if it wasn’t for her, the Earther contingent would be a waste of oxygen. Watching Rev. Anna bring honor to Christians in the 2200s is good. We got a few scenes with Elizabeth on The Expanse 3×08, but seriously wasn’t Anna awesome? One of the appealing aspects of her character is the way she reacts every time someone mocks her for her belief. She always has a good comeback that makes the other person look stupid. The way Elizabeth delivers that line – with that total calmness (in contrast with what she’s actually feeling inside, hearing conversations she doesn’t actually like) – makes it even more stinging and makes all the others in the room look like idiots compared to her. When people are afraid of the unknown they generally try to drive out that fear deriding the object that makes them feel uncomfortable. Religion is not an aspect that The Expanse dealt with in the past and that makes us think it’s not something well seen or considered by majority of the fictional characters, which is the reason of all the mockeries towards Anna. Although she is not presented like a stereotype of a religious figure. In spite of the fact that she’s actually a pastor, she’s more a spiritual rather than religious woman. She doesn’t use the name of God to give her opinion or to make a choice about something. It’s more like she does that because it’s the right thing to do for humanity or for people involved in those circumstances. And that is probably the best way to establish a connection with someone. We don’t mean that she does that on purpose, it’s just the way she is. She’s so smart and sassy, but it’s not just that, Anna is the only one who is able to understand people, probably because she’s the only one who actually cares. That is why she gets suspicious when she sees “Melba” and soon after that Anna realizes she is also a troubled soul. Obviously Elizabeth embodies that Anna’s quality perfectly with her body language and her soft voice. We really need to see how they will proceed between the two. Past ratings can be viewed at this link. 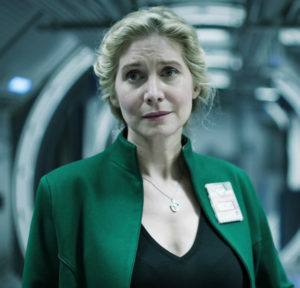 Interestingly, the story has also put Anna (Elizabeth Mitchell) into close contact with Melba, so the chances of these two great actors giving us quality scenes together in the future is high. PS: There’s nothing about Liz or Anna in the official podcat and on the official site they only posted this gif.